To some, beer is something you just swill down while watching football, and flavor is a distant after-thought. But others will sip and savor a beer, picking it apart like a connoisseur of fine wines. Those that comfortably sit in that second category won't think twice about dropping some hard-earned money on a bottle of finely crafted suds. But $200 for a single bottle!? That takes a special kind of person, and it had better be a special kind of beer. Thankfully, Sam Adams' Utopias 2013 doesn't disappoint. It's Friday afternoon, you've made it through the long week, and it's time for Happy Hour, Gizmodo's weekly booze column. A cocktail shaker full of innovation, science, and alcohol. I'll take the forty dollar PBR, please. Sam Adams—who are to craft brewing sort of what Will Smith is to the summer blockbuster—enjoys experimenting with some pretty out-there stuff. In 1994 Sam Adams founder and brewmaster Jim Koch released a 17.5-percent ABV Triple Bock, with the idea of expanding people' notion of what beer could be. Remember, this was long before the craft brewing industry exploded into what it is today, and there wasn't much you could get your hands on in terms of weird stuff. These sorts of experiments evolved until 2002, when it came out with its first Utopia series. Coming in at 24-percent ABV, it was stronger than just about anything on the market. The aged, uncarbonated beer was made in extremely small quantities, and became kind of a collector's item among beer fanatics. It's been brewed seven more times since then, including this year's entry. Sam Adams starts with a blend of two-row Caramel and Munich malts. This is what gives the beer that deep amber color. Three varieties of noble hops are used (Hallertau Mittelfrueh, Spalt Spalter, and Tettnang Tettnanger) to give it character and balance. Several strains of yeast are used during fermentation, including champagne yeast, which helps get the beer up to its higher ABV. The beer you ultimately end up with at the end is a blend. Some beer is aged in single-use bourbon barrels from the Buffalo Trace Distillery. For the 2013 edition, they added a bit of Sam Adam's Kosmic Mother Funk, a Belgian-style ale that's barrel-aged for up to two years in Hungarian oak tuns. Some of the beer that's blended in has been aged in different wood barrels for more than 20 years. The mixture then spends some time in port casks from Portugal, which darkens the beer further and imparts a very distinctive flavor. All of this happens at the "Barrel Room" at Sam Adams' Boston brewery. "Utopias takes time to perfect," said Brewmaster Jim Koch. "We are constantly checking in on it: tasting, comparing, blending vintage beers and trying different blends to see what might improve the flavor." The beer is then packaged in a unique ceramic decanter, modeled to look like a brew kettle. From the outside it looks like it's all copper, and it has odd sliding doors which reveal a picture of Sam Adams etched into the ceramic underneath. When you unscrew the top it reveals what looks like an ordinary bottle-cap sitting on a ceramic bottle. Only 100 wooden barrels of Utopias 2013 was made, which translates into fewer than 15,000 individual 24-ounce bottles. Each bottle is numbered on the bottom. This year's brew is a full 28-percent ABV. 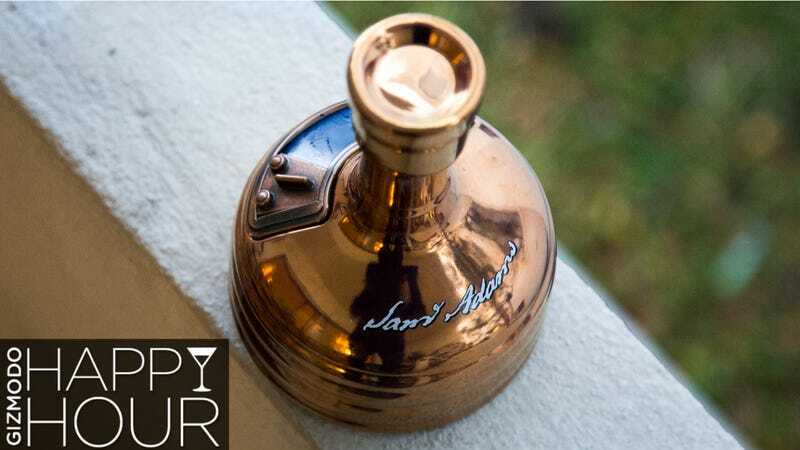 Sam Adams recommends serving Utopias at room temperature, neat, in a one or two-ounce pour, ideally in a snifter. Not having a snifter handy (I just don't snift much these days), I used a rocks glass. Pouring it in, it has a beautiful, rich dark amber color. If I didn't know better I would have thought it was a high-end sweet vermouth from the looks of it. I took a sniff. The first whiff was a little bit soy sauce and a little bit rice vinegar. I didn't know whether to take a sip or dip a gyoza in it. Second whiff, it almost came off a bit like a good vermouth, but less sweet, more savory. Meatier. Makes the mouth water a little. I dove in. First sip and I thought, "I can't believe this is a beer!" It's very sweet and winey. Much sweeter than any beer I can think of, but, holy crap, it's good! It's so smooth, and it has many layers of flavor. Extremely nuanced, with notes of black cherry and fig, and still some of that rich caramel underneath it. Really lovely finish, too. I could sip on this after dinner every night. It reminds me of a port or a sherry more than anything, but it isn't as sweet as most ports or sherries, or at least the sweetness isn't cloying. It's rich and satisfying. So, here's the thing: It's good. It's excellent in fact. But is it "200 dollars good?" Obviously, that's subject to your tastes, but for me, there's no way. For about $40 more, you could buy a bottle of Macallan 21 year. Or you could buy two bottles of Lagavulin and still have $40 left to spend on dinner. To me, a whole bottle of this just wouldn't make sense, but, then again, I don't have money to burn. But if you've got the cash and you really love beer (and also really love port, since it's very similar) then, sure, buy a bottle. We were told that, as long as you keep it at a stable temperature with the cap tightly screwed on, it should age very nicely. Some people keep their Utopias for years, tasting them every now and then to see how they're changing.